An electric race car team in Australia just became the first team to race an electric car against gas powered race cars on equal terms. 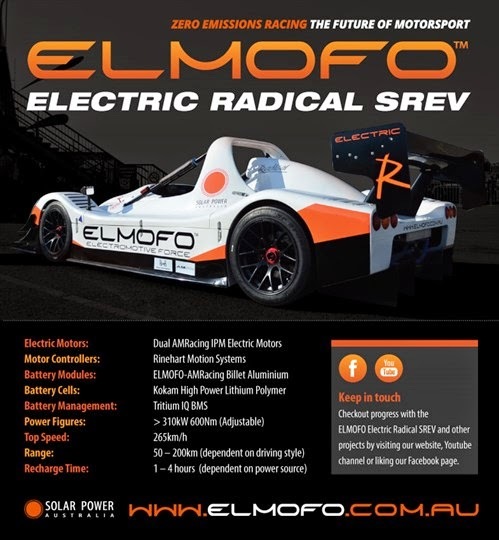 The team, ELMOFO (electro motive force), builds high end electric cars, and has built a race car based on a Radical SR8 chassis. With that car they entered the 2014 NSW Motor Race Championship at Sydney Motorsport Park, last weekend. While a battery pack problem prevented completing the weekend the team reportedly made a great showing. The team was able to enter one race and place third, for a spot on the podium. But a battery cell issue meant bowing out of any other races. 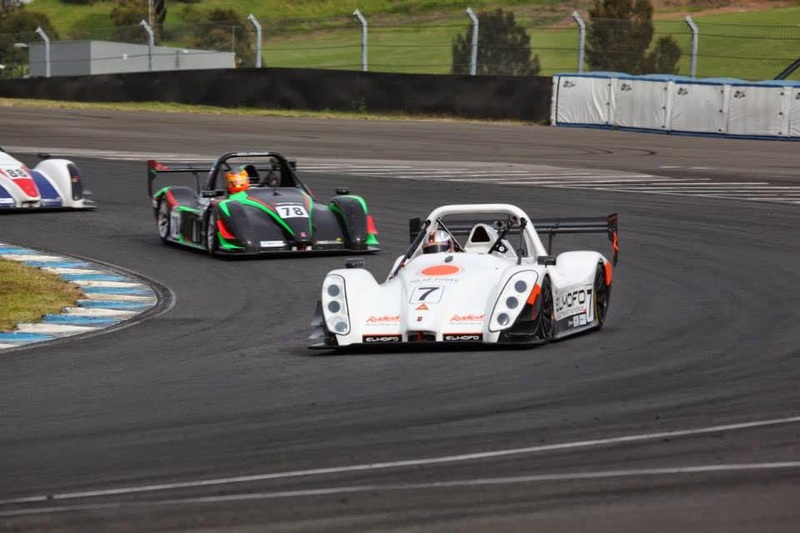 Taking a podium spot put the Australian racing scene on notice, electric cars are coming fast. In this case, at speeds up to 265 km/hr (165 miles/hr) and with 600 nM torque. IIRC, that is faster than the Formula E cars. The ELMOFO team had a very positive and educational first round of the NSW SuperSports State Championships. Thanks to everyone that came out and showed your support. The car completed qualifying and the first race until a technical issue forced an early retirement from this round. The first race proved that the electric driven Radical is more than competitive with the petrol powered Radical SR3s, so stay tuned for Round 2. This video posted by the team shows the insane torque, that let driver Garth Walden immediately jump to 3rd place off the line. He stayed in 3rd through most of this video, meaning the car is faster than about 6 other (gasoline powered) Radical SR8's but was unable to catch up with the two front runners. It's not just a fast car, but ELMOFO had an ingenuous charging system in use at the track. If the Sydney Motorsport Park is like other tracks I've gone to, the electrical supply in the paddock is minimal and primarily meant for power tools and not fast charging electric race vehicles. Instead of lugging a diesel generator, as some teams do, ELMOFO has collaborated with a solar power company who brought a solar panel array. The panels charge a battery pack, that's then used to dump charge the on-board pack through a fast charging controller.